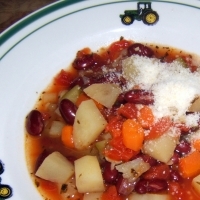 I was a vegetarian for 10 years and perfected this stew over time. It is very filling and full of vegetables - you'll never miss the meat! We serve it with warm french bread for a comforting, hearty meal. Hearty. Lots of good flavor. See Hearty And Healthy Vegetarian Stew for more slurpings. Made this today and was most flavoursome! Fantastic! Made this last night and took for lunch today. Great flavors, followed exactly, although I did add 1 diced sweet potato to the mix. Loved this stew! Thanks! This looks like a great alternative to a meat-based stew. I am not a vegetarian, but like vegetables more than meat, while my husband says as soon as they make meat a vegetable, he's right there! I am looking forward to trying this during our cold Midwest winter. Like stylistmama's recipes? Never miss an upload!